Steel Rolling mill is mainly used in steel factory which produce deformed bar, wire rod, channel steel , flat bar or other products.The production line is supposed to use continuous casting billet with size of 150*150*12000mm The allowable tolerance for section dimension of billet should be in accordance with the regulation of YB-2011-83. Production line with annual capacity: 600,000.00 tons, automatic continuous rolling mill applied. — Roughing rolling mill stands: Ø550 x6 short stressed rolling mill in Horizontal/vertical arrangement. 6 stands. — Intermediate rolling mill stands: Ø420 x6 short stressed rolling mill in Horizontal/vertical arrangement. 6 stands. — Finishing rolling mill stands: Ø320 x6 short stressed rolling mill in Horizontal/vertical arrangement. 6 stands. 3 of the rolling mill stands are horizontal/vertical interchangeable rolling mill stands. Bar Φ8-32mm debar; wire-rodΦ6.5 — 16 or 20 mm; section steel finished product size up to requirement. The raw materials cross section is mainly 100×100 mm2 — 200×200 mm with annual production capacity up to 100,000 to 1,000,000 tons. The lines will use cold or hot continuously cast billet for production. The billet is hoisted to the billet frame, then pushed into heating furnace for heating by billet pusher. Normally the heating furnaces type is from coal-burning end-in and side-out. The output capacity is normally 40 tons per hour. 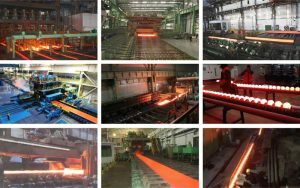 According to the different requirement on heating for different kinds of steel, after the billet is heated to the temperature required, the billet will be sent out from the heating furnace to rolling mill for rolling via billet-out roll-path. The rolling mill adopts semi-continuous arrangement with 17 times of rolling for bar and 23 times of rolling for wire-rod. The rough rolling unit mainly usesΦ500 3-roll for blooming and 5 continuous rolling units; intermediate rolling uses semi-rolling unit uses semi-continuous rolling which normally consists of 6 to 8 Φ380 2-roll type bearing rolling unit, final rolling (or preliminary final rolling) consists ofΦ350 2-roll type bearing rolling unit with the rolling mills all driven by AC motors. After rough rolling, there is a set ofΦ800 disc type fly shear for cutting the ends to make the work piece go to the next rolling smoothly. After bars finished products K1 outlet, Φ550 disk type multiple-length fly shear is used. After the shearing, there will be double-trough for bar separation, tail clamping device, PC automatically controlled multiple length, trough separation, tail clamping. The cooling bed uses walking beam notch-bar type automatic cooling bed, and it is with cold steels front end aligning device and steel conveying device. The bar, divided into multiple length, via the input frequency inverting roll way, goes onto to the auto cooling beds steel loading device, and then is unloaded onto the cooling bed for straightening and cooling. Near the outlet side of the cooling bed, there is a group of bar front ends aligning roller way to align the bar heads. After the bars are cooled to around 200 on the cooling bed, the bars will be collected in rows by the bars collecting device at the side of the cooling beds outlet. The cooling beds output roller way sends bars in rows to fixed cold shear for cut-to-length shearing, after shearing, the bars will be sent to inspection table through roller way for steel conveying and inspection. Qualified bars will be packed in bundles manually which will be weighed and name plates will be put on, then hoisted to warehouse by cranes. Wire-rod heat-radiating cold wire-rod mainly consists of loop laying head, heat radiating roller way, steel accepting device, collecting core rod, conveying chain, vertical packer, collecting table, horizontal packer, etc with 2 kinds of arrangement of 2 lines or 4 lines. Wire-rod finished product, after K1 outlet, goes into loop laying device, becomes wire-rod in loops, is conveyed on heat radiating roller way, is continuously cooled, enters the steel accepting device at the end of roller way, is colleted to be loose packing by collecting core, sent to the tightening device for being tightened into small packages, conveyed to rotary table to be collected into big packages, and finally hoisted to horizontal packer for tightening, packing, inspection and going into warehouse. Channel steel and/or angle steels finished product, after K1 outlet, goes onto the steel loading roller way, then goes to the notch-bar walking beam for cooling, conveying, steel unloading. The channel steels cut to length uses hot saw for cutting to length, then goes into the collection and inspection, inspection and packing table through conveying roller way. After inspection and packaging, the packaged bundles will be sent to warehouse for piling up.